This is so sad. What did I do Tuesday when 4.1 hit? I stacked all my crafting mats in my legacy cargo hold and reveled in the glorious space. No, I didn’t play Chapter 10. Sorry, Kaliyo, but a walk-in legacy cargo hold is more interesting than you. Then I made dye kits. As a surprise to me, the medium gray/medium gray looks like absolute crap on everything that I’ve tried to use it on. And the white/light gray looks so badass (it’s pub-side perfect). 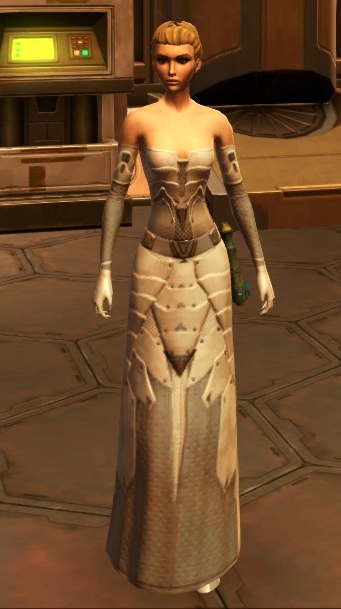 Was not expecting a plunging neckline dress out of the SWTOR line. It seems so…. Formal. Yea what is that piece? That would look good on my Consular. It’s the sensuous dress from a while back. Now that chance cubes are dropping old sets, maybe you’ll get lucky on the GTN. I love this dress because it is a good example of showing SOME skin in a classy manner and not being utterly gross (cough underboob cough).